Apple has given the music app a very beautiful new design, which makes it easier and more fun for people to explore their music collection. You can add your own image and a unique description for personalizing your playlists. You have the option of adding stunning pictures of your favorite artists and musicians in the Artists View. The album list displays all the albums and you can choose whichever album you like. The music you love and enjoy is only a tap away. Playlists and albums that you have added recently will be visible at the top of the library, which makes it effortless for people to find something they want to play. You only have to tap on play on the specific music and get it going. It has become easier than ever for people to discover music with the iTunes Radio. The Recently Played category will show you your favorite stations and you can return to them easily. The Featured Stations section has a selection of hand-curated stations or you can also begin a new station from your favorite song or artist. You will be able to see what’s playing with the new MiniPlayer and you can easily control playback while you are going through your music collection. You just have to tap on the MiniPlayer for opening the Now Playing option. A stunning new design has been given to Now Playing, which showcases the album picture and artwork exactly the way it should be. Furthermore, you can use AirPlay for beginning the streaming process wirelessly without even leaving Now Playing. Finding out the songs that you want to play next has become quite simple now because you just have to go to the Up Next icon, which can be found in the Now Playing section. 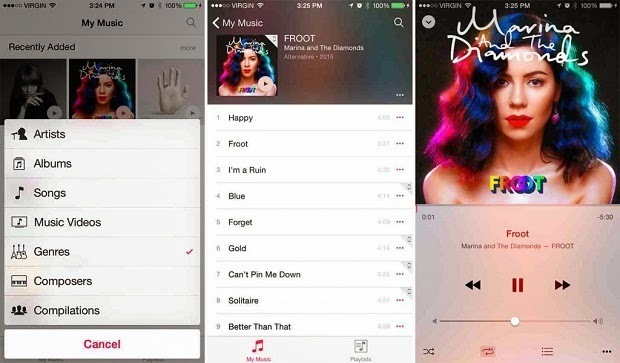 You can even add, reorder and skip songs if you want. There is a magnifying glass in the music app, which allows you to search from anywhere. You will have no problem in finding the perfect song as the search results will be organized conveniently. An iTunes Radio station can be started directly from Search. A new split-screen interface has also been added in the iPad version of the Music app and as far as the iPhone is concerned, the landscape interface has been removed altogether. Nonetheless, the icon for the app remains unchanged despite the numerous changes that the company has made with the introduction of the iOS 8.4 beta.